Your Christmas lights are beautiful, and they should fill your family and your neighbors with joy this holiday season. Since the results are beautiful, what you might not expect is back pain and endless amounts of frustration, as the task itself can be less than pleasant. Before you put a single light up, make a list of all of your existing holiday decorations. It’ll help you stay organized, and you can make a trip to the store without forgetting one set of lights or some garland, which will require a separate trip and waste your time. With your list in hand, take a walk around your property. Visualize where you’re going to hang your holiday light strings. By developing a plan ahead of time, you’ll minimize how much time you spend adjusting your decorations later. Installing a string of holiday lights requires climbing up and down ladders for about 15 minutes. Imagine spending all of that time only to realize that your lights won’t turn on, and you can’t figure out if a bulb is broken or if an inline fuse is destroyed. You have to spend another 15 minutes to tear everything back down, but you could have saved yourself a headache by simply plugging in the lights first. At the very least, you’ll find out if a string can be repaired or salvaged for parts without wasting your time. 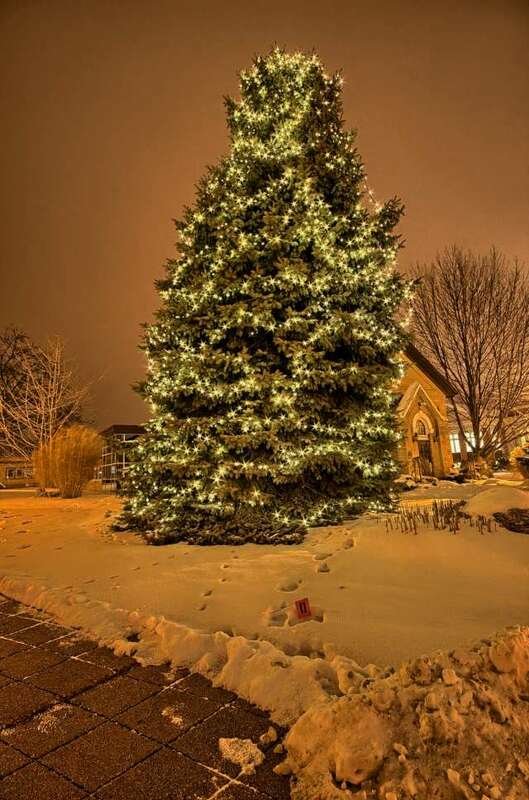 As a general rule of thumb, don’t connect more than three sets of lights together. Additional strings increase the risk of a short and can even throw your circuit breaker, which will put a quick end to your holiday cheer. To protect your home, use a surge protector on any outlet with multiple light strings. Millions of families go on vacation during the holidays. If you’re going to be out of town for more than a day, consider using automatic timers with your Christmas lights. 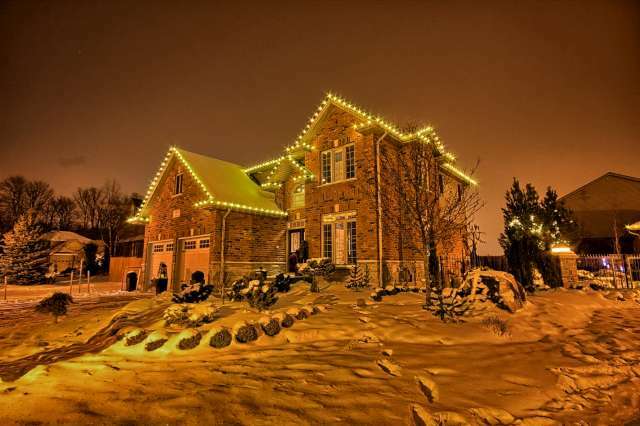 Burglars often look for homes with unlit holiday light displays, which is a sure sign that nobody’s home. Many timers come with batteries, and they’ll continue keeping track of the time during a power outage. When power is restored, they’ll turn your light display back on. Set your timer to turn the power on around 5 p.m. and turn the power off by 11 p.m. or midnight at the latest. You’ll save electricity by not leaving your lights on 24 hours a day, and you’ll still look festive (and protect your home from burglars). Now comes the hard part. Once all of your lights are in good working order, try to wait for a day with beautiful weather. You don’t want to climb up and down a ladder that’s slick with rain, and you certainly don’t want to rest it in soft mud. 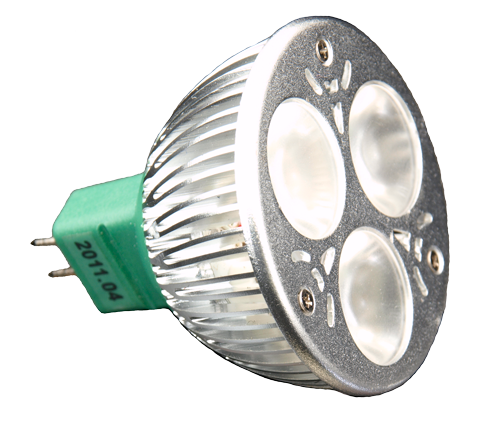 Install lights during the afternoon when there’s still plenty of daylight. Unfortunately, homeowners don’t have the same kind of equipment that professional holiday light installers have access to for the safest installation. Don’t hang lights by yourself if you need to use an extension ladder. You could easily break a bone if you fall while installing lights on the second story. A spotter can help stabilize the ladder and call for help if you do fall. 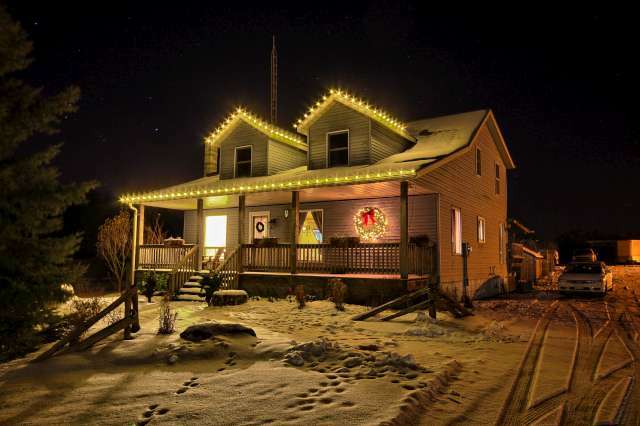 Don’t want to bother with the onerous task of installing your holiday lights this year? Give us a call for a free quote. Landscape lighting is really the icing on the cake when it comes to having a gorgeous landscape that looks finished and provides maximum outdoor enjoyment for homeowners. It is critical to maintaining safety on patios and along walkways, as well as highlighting features such as accent plants, raised beds, and water features. But what’s the best way to do it? And where to look for fixtures that won’t require annual replacement? You want to sit back and enjoy your sparkling landscape, not labour in it, right? While the do-it-yourself kits at home improvement warehouses may seem like a good deal for the frugal homeowner, the fixtures are often shoddily manufactured and won’t have the quality and durability that a professional system will provide. They frequently require regular, possibly even annual, replacement of cheaply made fixtures and parts such as timers and transformers, creating additional costs and labor when one wants to enjoy the landscape instead of constantly maintaining it. A professional landscape contractor will provide a comprehensive warranty to ensure against defective parts and premature wear and can also quickly troubleshoot the system whenever there is a problem. 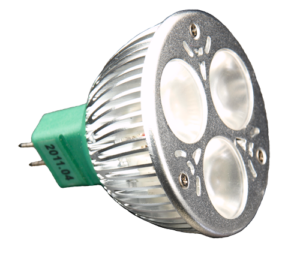 Even better- on your average professionally installed LED system, you won’t even have to change a bulb (they might only burn out every 10 years). As with anything, design and installation by someone that knows what they’re doing costs money. 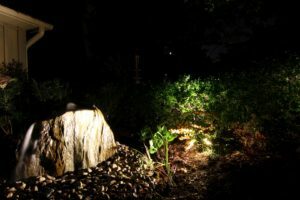 Homeowners looking for landscape lighting solutions might be tempted to spend time and save money by purchasing a ready-made kit from a big box store, but they’re risking doing a lot of work for substandard results. These kits are usually not easily customizable or expandable, so having to install multiple kits becomes a distinct possibility, increasing the likelihood of installation issues and future problems. 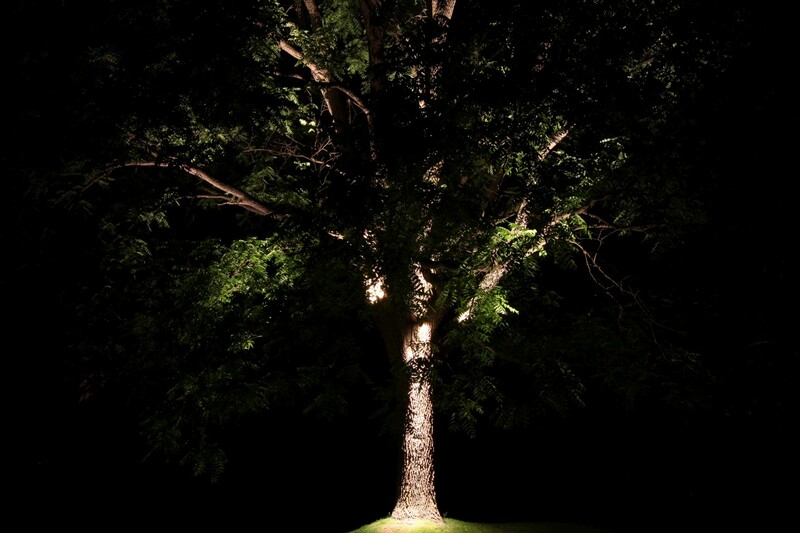 The primary key to beautiful landscape lighting is the design. A professional contractor will have the design experience to know exactly what types of lighting to use in different areas of the garden landscape to get just the right effect and highlight distinctive features in the yard. A professional will know how to place fixtures to avoid creating annoying glare or strange shadows that produce creepy effects. This is one area where planning with a professional will really pay off. This field is about the result fixtures create, and unlike regular garden design- the final result is not just about where something is placed. Working with a specialized contractor will give noticeably better results than working with a generalized one. This is because they’re used to creating designs based on effect, and not just on placement. Another crucial aspect to having a gorgeous end result is installation. Landscape lighting installation can be extremely complicated and time consuming for the non-expert. Frequently kits end up being returned to garden centers after unsuccessful attempts at DIY installations. Calculating the proper voltage based on cable length and number of lights installed on a specific line alone can be difficult at best and disastrous at worst for the amateur installer. 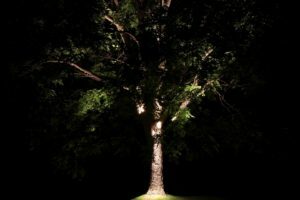 An experienced, professional landscape lighting contractor will do all the work the right way the first time, including hiding cabling throughout the yard, correctly splicing fixtures into the wiring, properly installing halogen bulbs to ensure maximum life span, and adjusting brightness so that each fixture produces the desired effect. A pro will also program the system to make sure that the lights come on at the right time for the geographic location and seasonal variance in daylight hours. By spending a bit more up front instead of over time, homeowners can give their average landscape a real wow factor with professionally designed and installed lighting. For those who will be content with mediocre results and aren’t concerned with potentially having frequent problems and making future expenditures, a cheap, standard do-it-yourself kit might be the answer. 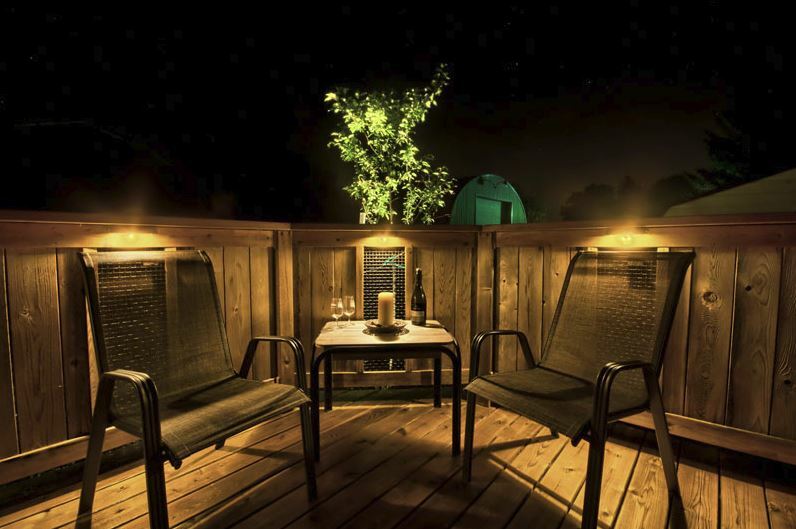 Unfortunately, they will likely never realize the full potential of their outdoor living space and the comfort, safety, and satisfaction a magnificently lit landscape can provide.